345. What is the range of the function defined by f(x)=1/x+2? The right circular cone above is sliced horizontally forming two pieces, each of which has the same height. What is the ratio of the volume of the smaller piece to the volume of the larger piece? 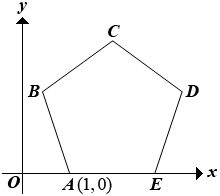 In the figure above, ABCDE is a regular pentagon with side of length 2. What is the x-coordinate of D? 348. For a class test, the mean score was , the median score was , and the standard deviation of the scores was . The teacher decided to add points to each score due to a grading error. Which of the following statements must be true for the new scores? I. The new mean score is . II. The new median score is . III. The new standard deviation of the scores is .